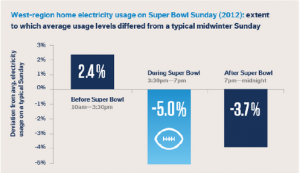 The energy consulting firm OPower released a report this week revealing that energy use actually dropped throughout the country during the 2012 Super Bowl -- plasma big screens be damned. The company looked at anonymized data from 145,000 households during the last Super Bowl. This is what energy consumption looked like in the Western U.S. (a sample size of 91,000 households) before, during, and after the event compared to a typical Sunday at that time of year. Electricity consumption spiked a bit before the game, presumably as people were preparing food, and then it dropped to 5% below normal levels--and during the half-time show, it dropped even further to 7% below normal. So what explains the drop? You can thank the social nature of game day. As OPower points out, a Nielsen poll in 2011 revealed that 45% of Super Bowl viewers planned to watch the game with friends and relatives -- and that means fewer TVs and lights are on, using up energy. And despite all of the liveblogging (Oh, hi there!) and tweeting going on, people often become so fixated on the game that they are less likely to be using other devices while they watch. Go figure. Beyoncé fierceness kills the power, and the Super Bowl saves it.